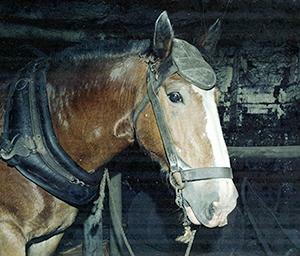 Pit horses were used in the Australian coal industry well into the twentieth century. Because the coal seams in New South Wales mines tend to be thicker than those in Britain and Europe, the tunnels are higher, and large breeds of horses were used in our mines instead of the small, but hardy pit ponies of the British and European mines. The picture on the right shows Sam, one of the pit horses at Stockrington No. 2 Colliery. It was taken on 31 October 1978 by Brian R. Andrews who has kindly given us permission to publish his photos. Cessnock Rotary Club will conduct its annual Pit Horse Derby in November, at a date to be fixed. This is one of the most popular events, ever staged on the coalfields, and is eagerly looked for ward to by the whole of the population. It is pleasing to see that the Rotary Club intends to give the citizens of Cessnock another great treat in November. The profits will be divided between Cessnock and Kurri Hospitals. The video below left is from British Pathé, and shows the pit horses at Muswellbrook mine in 1965. The horses were cared for and handled by a "wheeler". The slideshow below right features pictures of pit horses from the Cultural Collections Flickr site. The collections include those of Brian R. Andrews, Jim Comerford and Barry Howard. See the set on Flickr.